Mobilizing more than 40-member public health institutes with over $1.4 billion in annual funding – as well as 10 university-based regional training centers, and 40 affiliates – NNPHI is a social, financial and information network, connecting more than 8,000 subject-matter experts with organizational partners across the nation. 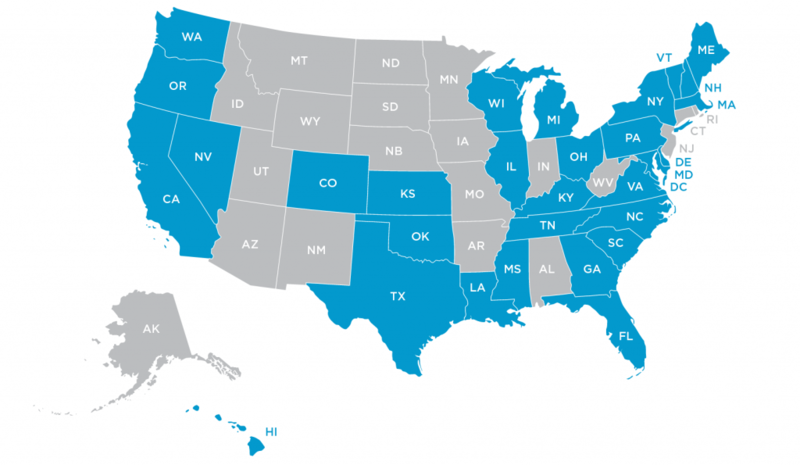 With an expansive organizational presence (in blue) and activities across all 50 states, the national network is a go-to resource for analysis and best practices. We also provide important network connections for communities, government agencies, foundations, the health care delivery system, media, and academia. Learn more about public health institutes. We work to unite public health institutes, training centers, community organizations, government agencies, health care systems, and businesses in advancing public health practice and improving population health. To improve population health, the national network supports the public health workforce, promotes collaboration across sectors, and drives the field towards cutting-edge research and practice. With a long track record of providing quality technical assistance and a commitment to working in partnership with people and communities, our network of public health institutes is committed to promoting and improving health and wellness for all. We are a go-to source for guidance, resources, research, analysis, and best practices about population health and the social determinants of health. We are deeply familiar with local challenges and opportunities because we are deeply rooted in our communities. We specialize in bringing people, organizations, and communities together to advance common goals. We thrive on supporting our partners. We multiply our expansive reach, influence, expertise, and value through membership in the National Network of Public Health Institutes. Welcome to the National Network of Public Health Institutes! Representing more than 40 organizations and over 8000 subject matter experts, learn who we are, what we do, and how you can engage with our vast network by downloading the NNPHI Booklet.